Chromebook Acer is the latest Travelentz Gadgets that we bought before Thanksgiving week. Husband is so happy with the design and it is lightweight. Overall he like the Chromebook except the Skype is not available in the Chromebook. 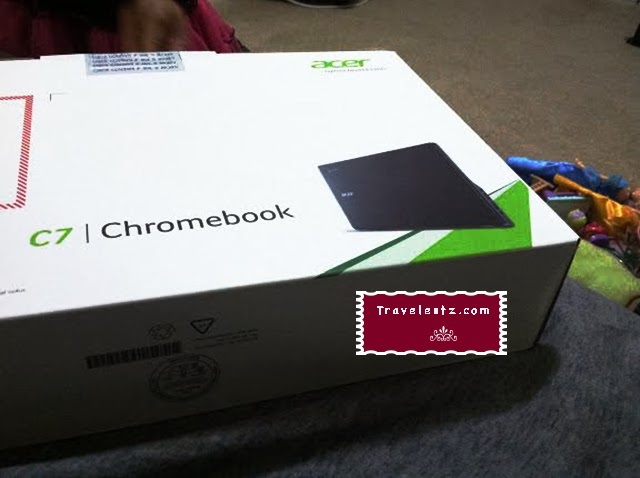 Why did Travelentz bought the Chromebook? The main reason why Mr. Travelentz bought the Chromebook because of the USB and HDMI plus the cost is so reasonable.Though he owned an iPhone 5 he still wants to have a chrome book.The Nexus 7 that he just bought last month goes to me.heheheh. I know he loves to buy gadgets,luckily I inherited all of it so I am just waiting patiently. The good thing I'm not really into gadgets am just happy to have my iPhone plus my nexus 7 which is my e-reading while my daughter has an iPad 3 that she inherited from me. What is a Vacation Clubs? Sail the Open Seas in a Solar Powered Boat!